DLS or NTA which is better suited for nanoparticle size? Nanoparticle Tracking Analysis or Dynamic Light Scattering ? Since the Nanosight gives me particle concentration, it’s somewhat straightforward to calculate what % of my Nanoparticles are aggregated. Can I calculate % aggregated particles in the DLS as well? Or does the varying amount of intensity, and the protein+nanoparticle mixture in the sample confound that calculation? If I wanted to measure non-spherical particles (for example nanorods), which system would give me a more accurate diffusion coefficient/size? Here is my assessment of the situation and the answer I provided. By sharing it may be of use to others in a similar situation. The NanoSight utilizes the technique of Nanoparticle Tracking Analysis (NTA) where the trajectories of individual scattering objects are observed under a microscope and their displacement related to each object’s size. The Zetasizer Nano utilizes the technique of Dynamic Light Scattering (DLS, also known as PCS and QELS) where the intensity fluctuations in the scattered light are analyzed and related to the diffusion of the scattering objects. 1) Yes, the NTA can give the % by number of aggregated particles directly. DLS can provide the % by intensity of aggregated particles directly. This DLS result can then be mathematically transformed to a % by weight and a % by number (provided good data quality). However for that transformation the refractive index of the material must be known, and is assumed to be modeled as spherical particles. If the aggregates are smaller than 100nm this often does not really matter, for larger sizes, the peculiarities of Mie scattering come into play and then refractive index and shape could make the mathematical transformation problematic. For % intensity no assumptions are needed. If the sample contains so much scattering signal from the larger species that the smaller ones are ‘over-shadowed’ and not detected, then converting to a number distribution will not be able to show that contribution. In the conversion from intensity to volume or number distribution all particles of the distribution are assumed to be of the same material and have the same refractive index properties. Also, DLS cannot give the concentration of particles per mL. 2) Both NanoSight Nanoparticle tracking Analysis (NTA) and Zetasizer Dynamic Light Scattering (DLS) measure the diffusion coefficient and derive the size from that diffusion coefficient. So both are influenced by shape in the same manner. NTA will give a number weighted distribution, DLS will give an intensity weighted distribution. NTA can often provide higher resolution, DLS may be a faster assessment of the mean size and polydispersity. If you had perfectly monodisperse samples both should give very close to the same answer. 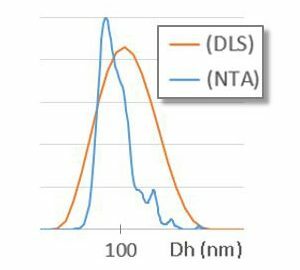 In NTA you may be able to selectively look at only a fluorescently tagged part of the distribution, in DLS this is not possible and fluorescence may make measurements more difficult or even impossible (e.g. quantum dots). NTA can detect samples 10-1000 times more dilute than DLS. NTA may require samples to be diluted. DLS ensemble averages the signal from at least 2-4 orders of magnitude more particles than NTA. DLS may be able to handle a wide concentration range without dilution. In summary, it really depends on what you want to do. In an ideal scenario you may want to consider a combination of both systems to take advantage of the complementary information the two techniques can provide. With the improved utility of DLS systems (like the Malvern Zetasizer Nano) and NTA systems (like the Malvern NanoSight) the user base has expanded far beyond dedicated light scattering experts – so it’s great to know that if you do encounter any questions, we’re always here to help.